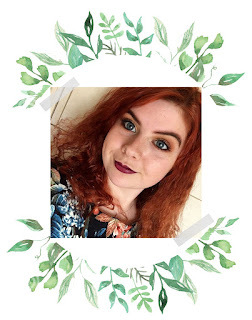 I did a random summer wishlist a few weeks ago and really enjoyed writing about it and preparing the post, so I'm back today with one specifically for eyeshadow palettes! I love eyeshadow - it's my favourite part of my makeup routine, so all palettes I do end up getting end up very well loved! 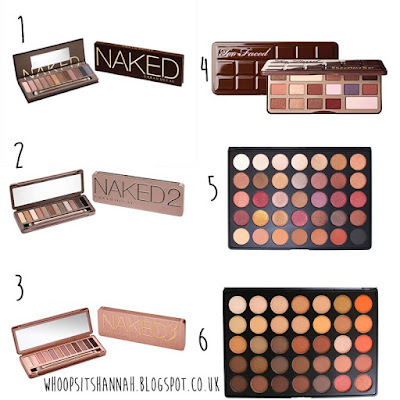 The Naked palettes are a staple in any beauty blogger's makeup collection. The first one has several bronze shades, perfect for my blue eyes. Naked 2 has more browns than bronze shades, which would still suit me. I wear a lot of brown eyeshadows usually, so I know I would get a lot of use out of this! The Naked 3 palette is a lot paler when compared with the other two. It has several pink shades as well as a few paler browns, and would be perfect for spring and summer makeup looks. I am a huge chocoholic, and so the fact that this palette smells of chocolate is very appealing to me! I think that the shades are beautiful and I would get a lot of use out of this palette! To compliment my blue eyes, I wear a lot of brown and bronze shades, and this palette is full of them. I like that a few of the shades are practically red - none of the palettes I currently own have dared to do something so bold, and it's something I'd really love to incorporate into my looks. A lot of the eyeshadows I choose tend to be shimmery or glittery. I love the glamorous feel that gives me! However, I'd quite like to branch out and try more matte looks, and this palette, filled with brown and bronze shades would be useful in helping me to do that! 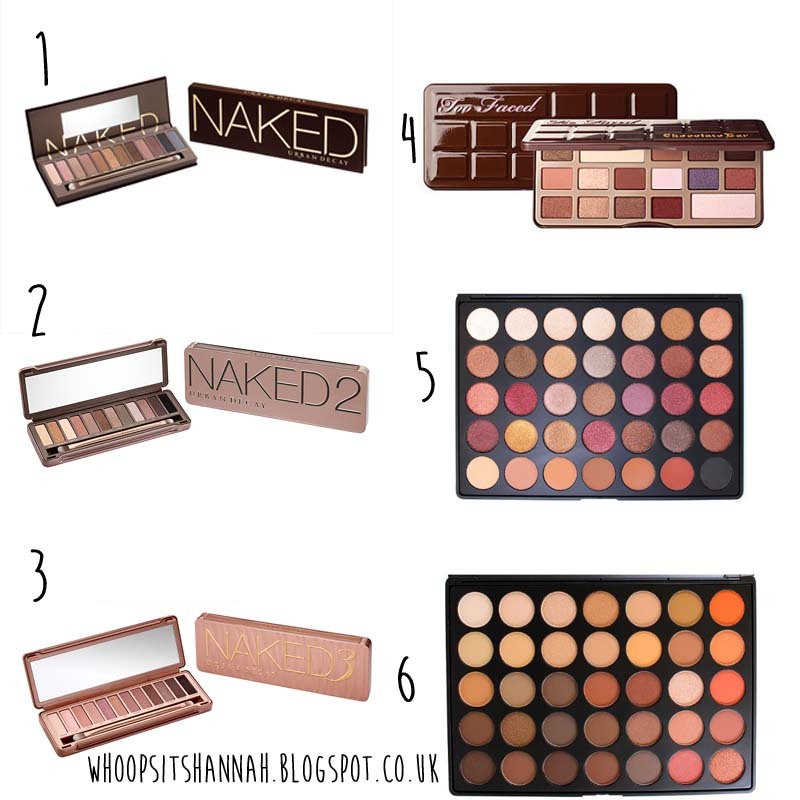 Do you have any palettes on your wishlist? What do you think of my picks? Let me know in the comments!